The Railroad Commission, or Board of Railroad Commissioners, was North Carolina's first attempt to regulate businesses through a bureaucratic state agency. The commission was established by the Farmers' Alliance-dominated legislature of 1891 primarily to reduce freight and passenger rates on intrastate railroads and to increase the taxable value of railroad property. The statute creating the commission, drafted by the Farmers' Alliance caucus and its leader, Marion Butler of Sampson County, was modeled on similar laws in Georgia as well as the federal Interstate Commerce Act of 1887. The 1891 act provided for three commissioners, chosen by the General Assembly to serve six-year terms, whose major responsibility was to set or approve maximum passenger and freight rates for the state's railroads. Standard rates were generally derived from a comparative process in which the commission attempted to keep profits in North Carolina similar to those of railroad companies in other southern states. The 1891 General Assembly also empowered the Railroad Commission to prevent discrimination in rates or service, to require information from railroad companies, to promulgate administrative rules for passenger and freight business, to hold hearings on complaints about service or rates, to appraise railroad property for taxation purposes, and to act as a court of record in resolving disputes. Moreover, the commission's rate-setting powers extended to intrastate steamboat, canal, express, and telegraph companies. Its orders were subject to review in state courts. After the Democratic Party's successful white supremacy campaign of 1898, the 1899 General Assembly abolished the Railroad Commission and promptly established in its place a nearly identical Corporation Commission, whose membership the party could control. Despite its short life, the Railroad Commission signaled the beginning of a transformation in state government. The idea advanced by its agrarian founders-that the state should control the rates and services of certain transportation and communications companies through administrative action-was a radical step toward modern public administrative authority. The agrarian idea did not, however, produce radical results. In its greatest moment of political conflict, in 1897 and 1898, the commission deferred to railroad claims that especially low rates would drive the lines out of business. The experience of the Railroad Commission reflected the limitations of control that sought to sustain the interests of both the regulated businesses and the public. J. C. D. Blaine, Rate-Making and the North Carolina Utilities Commission: A Study in Public Policy (1962). Martha Frances Bowditch, "The North Carolina Railroad Commission, 1891-1899" (M.A. thesis, UNC, 1943). Annie S. Ramsey, "Utility Regulation in North Carolina, 1891-1941: Fifty Years of History and Progress," NCHR 22 (April 1945). North Carolina Board of Railroad Commissioners. 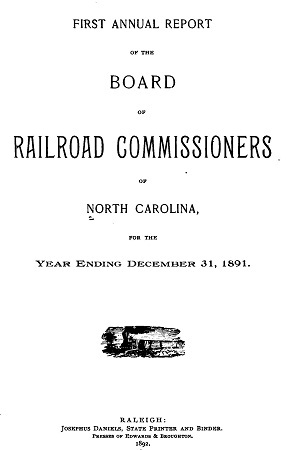 Annual Report of the Board of Railroad Commissioners of North Carolina. Raleigh, N.C.:Josephus Daniels, 1892.